The 380th Air Expeditionary Wing (380 AEW) is a provisional unit of the United States Air Force Air Combat Command (ACC). It is attached to the United States Air Forces Central component of ACC and is stationed at Al Dhafra Air Base, United Arab Emirates. About 1,200 active duty military members, Reserve, and Air National Guard personnel make up the Wing. Aircraft assigned: McDonnell Douglas KC-10A Extenders, Lockheed U-2 Dragon Ladies, Boeing E-3 Sentry (AWACS) and Northrop Grumman RQ-4 Global Hawk. Its mission is air refueling and reconnaissance. The Wing's origins date to 1942 when the 380th Bombardment Group was established. It operated primarily in the Southwest Pacific Theater as a Consolidated B-24 Liberator heavy bomber unit assigned to Fifth Air Force. The 380th Expeditionary Operations Group carries the lineage and history of its highly decorated World War II predecessor unit. Active for over 40 years, the 380th Bombardment Wing was a component organization of Strategic Air Command's deterrent force during the Cold War, as a strategic bombardment wing. The 380th Bombardment Wing (Medium) was established at Plattsburgh Air Force Base, near Plattsburgh, New York on 11 July 1955 and assigned to Strategic Air Command (SAC) Eighth Air Force. For the next 40 years, the 380th was a front line SAC bombardment Wing during the Cold War. Along with the wing's activation, the 528th, 529th and 530th Bombardment Squadrons were also activated. During July and August, the personnel assigned to the Wing arrived at Plattsburgh. In December 1955, the first Boeing B-47 Stratojet medium bomber was assigned to the Wing but instead of being flown to Plattsburgh AFB, was delivered to Pinecastle AFB, Florida, as Det 1, 380th BMW because of the delays in completing the base facilities at Plattsburgh. Major Harold L. Neal piloted the first flight of a B-47 by a 380th's crew on 27 January 1956 at Pinecastle. For the next several months, training continued while additional B-47s were assigned to the Wing. By the end of January 1956, 16 B-47s were assigned to the wing and increased to 30 by the end of April. The first B-47E arrived on 21 March 1956 piloted by Brigadier General Kenneth O. Sanborn, first commander of the 820th Air Division[permanent dead link], also headquartered at Plattsburgh AFB, but temporarily assigned to Pinecastle. The aircraft was christened "City of Plattsburgh" the next day. By June 1956, the runway and essential facilities were completed at Plattsburgh and the wing and Air Division moved its aircraft and headquarters to the newly constructed base from Florida. In September 1956, the 380th Air Refueling Squadron, flying the Boeing KC-97 Stratotanker, was transferred to Plattsburgh AFB from Sheppard AFB, Texas. The Wing was declared combat ready on 1 October 1956. In April 1957, the 380th deployed to RAF Brize Norton, England for a three-month period as part of a SAC Reflex Deployment. During this deployment, Wing's B-47 inaugurated the "Three Capitals" air race. The occasion was the Paris Air Show held at Le Bourget Field in Paris, France. On 28 May 1957, three B-47s from the 380th BW took off from Brize Norton and flew over Le Bourget to start the race. The objective of the race was to fly from Paris to Madrid to Rome and back to Paris, and the prize was the General Electric Trophy. A B-47E from the 529th BS won the 2,346 statute miles (3,776 km) race in 4 hours 12 minutes and 7 seconds, with an average speed of 558 miles per hour (898 km/h). The aircraft, commanded by Capt. Robert E. Sheridan was piloted by 1stLt. J.L. Mombrea with Capt. Frank R. Beadle as Observer. On 18 July 1957, the Wing suffered its first peacetime major accident. A KC-97G from the 380th ARS with a crew of eight exploded and crashed into Lake Champlain when 2 of the 4 engines failed 3 minutes after take-off from Plattsburgh AFB at 9:28 p.m. During February 1959, the Wing gained both the 820th Air Base Group and the 4020th USAF Hospital. Both of these units had previously been assigned to the 820th Air Division, located at Plattsburgh AFB. The 531st BS was activated and assigned to the 380th in May 1959. Later that year, on 7 August, another unit was attached to the Wing from the 820th AD, the 26th Air Refueling Squadron. The 531st was inactivated on 1 January 1962. Between 20 July 1962 and 24 December 1964, the 380th also flew EB-47 assigned to the 4365th Post Attack Command and Control Squadron. On 15 January 1962, the Wing suffered its second aircraft lost when a B-47E assigned to the 529th BS on a routine training flight making bomb runs over Ft Drum crashed on the southeast slope of Wright's Peak (a mountain top 60 miles (97 km) south of Plattsburgh AFB). The wreckage was discovered on the 21st by a group of US Army pilots from Ft Devens, Mass. 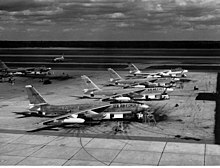 Later that same year, on 22 October 1962, the Wing responded to the Cuban Missile Crisis by deploying eight of its B-47s to a dispersal base. These aircraft and personnel stayed at the dispersal base until 25 November 1962 with the remaining aircraft and personnel on alert at Plattsburgh AFB. September 1965 saw one of the Wing's B-47s, "Pride of the Adirondacks" departing Plattsburgh AFB for SAC's 14th Bombing and Navigation competition at Fairchild AFB, Washington. Six days later, that same aircraft returned to Plattsburgh being hailed as the "World's Best B-47" after having won top honors among all SAC B-47 units in 3 of 4 competition areas for the B-47s. "Pride of the Adirondacks" was commanded by Maj. Charles W. Patrick with Capt. John V. Wilcox for co-pilot, Maj. Robert A. Wickland as navigator and Ssgt. John F. Navroth as Crew Chief. The crew won 'Best B-47 Crew, Bombing', 'Best B-47 Crew, Combined' and 'Best B-47 Unit'. Within three weeks of that triumph, the first B-47 departed for storage at Davis-Monthan AFB, Arizona as part of an accelerated phase-out of the type. On 14 December, a ceremony was held as the final three B-47s departed Plattsburgh AFB for the Arizona's storage facility. "Pride of the Adirondacks" was preserved and put on display at the entrance of the base on 8 February 1966. During 1961 and 1962, the physical appearance of the area surrounding Plattsburgh AFB underwent changes as construction began on 12 "Atlas F" missile sites. The sites were built within a 50 miles (80 km) radius of the base and were completed in 1963. The squadron was equipped with 13 missiles, allowing each silo to have its Atlas missile with one left for spare. When one missile in a silo was scheduled for maintenance, the spare missile kept at PAFB was sent to replace it. This allowed the 380th to maintain 12 ready to launch missiles seven days a week. All sites were in New York state except for two located on the other side of Lake Champlain in Vermont. The 556th Strategic Missile Squadron became completely operational on 15 September 1964. This was the last Atlas squadron to be accepted and the only Intercontinental Ballistic Missile base east of the Mississippi River. The 556th's last operational day was 30 April 1965 with the Squadron's inactivation on 25 June 1965. To replace the B-47s, the Wing was assigned the B-52G "Stratofortress" bomber and received its first aircraft christened "Champlain Lady" on 19 June 1966. After the arrival of the new type, another new unit was assigned to the Wing on 25 January 1967, the 310th Air Refueling squadron. On 21 January 1968, tragedy struck again the 380th Strategic Aerospace Wing when B-52G 58-0188, crashed near Thule Air Base in Greenland while on a Chrome Dome mission. The aircraft was flown by a crew from the 528th BS and was carrying four hydrogen bombs when it crashed into an ice covered bay at the western tip of Greenland. The crew of seven was composed of Capt. John Baug (commander), Capt. Leonard Svitenko (co-pilot), Maj. Frank Hopkins (radar navigator), Capt. Curtis Criss (navigator), Capt. Richard Marx (electronic warfare), SSgt. Calvin Snapp (gunner) and Maj. Alfred J. D'amario (safety officer from Wing HQ). Sadly, Capt. Svitenko was killed during the crash. The Wing's involvement in the Vietnam War was one of temporary duty assignments. Tanker and bomber crews of the 380th were temporarily assigned to the Pacific theater in support of B-52 "Arc Light" missions and KC-135 "Young Tiger" operations. The KC-135 crews and aircraft supported Southeast Asia operations from October 1966 until 1973. The B-52 crews served from 1968 until 1970. The stay of the B-52s assigned to the 380th was destined to be short. In 1968, plans were initiated to bring the Air Force's newest strategic aircraft to Plattsburgh AFB, the General Dynamics FB-111A. The FB-111A was the all-weather strategic bombing version of the F-111, intended as an interim successor to the B-52 and B-58 of the Strategic Air Command. On 8 October 1969, the FB-111A entered service with the 4007th Combat Crew Training Squadron of the 340th Bomb Group at Carswell AFB, Texas. Even though the FB-111A was officially declared operational, it had yet to reach the combat forces. After reaching operational capability, the 4007th CCTS relocated to Plattsburg and became part of the 380th Strategic Aerospace Wing. By the end of 1970, B-52s were transferred to Fairchild AFB, Washington and the last B-52G left Plattsburgh AFB on 5 January 1971. Construction requirements for the new FB-111A were completed in 1969. Col. G.R. Abendhoff, 380th BW's commander, piloted the first FB-111A to the base during Open house ceremonies on 17 July 1971. On 1 July 1972, the 380th Strategic Aerospace Wing (Heavy) was redesignated the 380th Bombardment Wing (Medium). During the 1974 Strategic Air Command's bombing and navigation competition, the FB-111 and KC-135 crews from the 380th combined their effort with the support personnel to prove to be "The best of the best". The 380th BW was the first Wing equipped with the FB-111A to win the competition and would dominate again in the years to come. 1980 began with a new challenge for the Wing after being named the official military support installation for the 1980 Winter Olympics at Lake Placid, New York. The 380th coordinated helicopter rescue mission conducted by the 38th Air Rescue and Recovery Squadron (a Plattsburgh AFB tenant unit later designated the 40th ARRS). As the Rockwell B-1B Lancer came into service, the FB-111A became redundant to SAC needs, and starting in 1988 most FB-111As began a conversion into a ground attack configuration (F-111G – less their nuclear delivery capability). As the aircraft were converted, they were reassigned to Tactical Air Command training units operating out of Cannon AFB in New Mexico. On 10 July 1991, Strategic Air Command and the 380th Bomber Wing said goodbye to the FB-111A when the last 4 operational aircraft left Plattsburgh AFB for their final flight to preservation in museums. The 380th BW was redesignated the 380th Air Refueling Wing a few days earlier on 1 July 1991. The mission of the 380th ARW was to provide worldwide air refueling with its KC-135A/Q Stratotanker and served as host to the Tanker Task Force operation. The 380th ARW Tanker Task Force was responsible for supporting most of the transoceanic operations on the East Coast. The wing was absorbed by Fifteenth Air Force, Air Mobility Command, on 1 June 1992 with the inactivation of SAC. As a result of the 1993 Base Realignment and Closure Commission, Plattsburgh AFB was closed on 30 September 1995 and the 380th ARW was inactivated. The 380th Air Expeditionary Wing was reactivated at Al Dhafra AB in the UAE in January 2002 to support the War in Afghanistan. The wing participates in Operation Enduring Freedom (OEF) and Operation Iraqi Freedom (OIF). ^ "General Officer Assignments". DoD. Retrieved 27 October 2014. ^ "Biography". USAF Vandenberg. Archived from the original on 14 June 2011. Retrieved 27 October 2014. ^ "Monaco D-21 System relocation". Federal Business Opportunities. Retrieved 27 October 2014. ^ "Pilot of U.S. spy plane killed". CNN. Retrieved 27 October 2014. ^ "U.S Spy plane crashes after Afghan mission". NBC. Retrieved 27 October 2014. ^ "380th Air Expeditionary Wing". U.S. Air Forces Central Command. 17 May 2017. Retrieved 16 September 2018.